In November of 1990, the Rev. Joe Weigman was a newly ordained transitional deacon in the Diocese of Toledo, on the path to become a priest. He was 29, in his final year of seminary at St. Meinrad in southern Indiana — about 10 miles from Santa Claus, Ind., and an hour away from Louisville. He was having some challenges with his legs and his balance, and was referred to a neurologist. Though his mother was diagnosed with MS in 1969, she was assured by her doctor that it was not a concern for her children, so Father Joe attributed his discomfort to stress. In March of 1991, however, his neurologist said Father Joe had the same disease as his mother. With that news, he said, he was concerned about whether he would be made a priest. 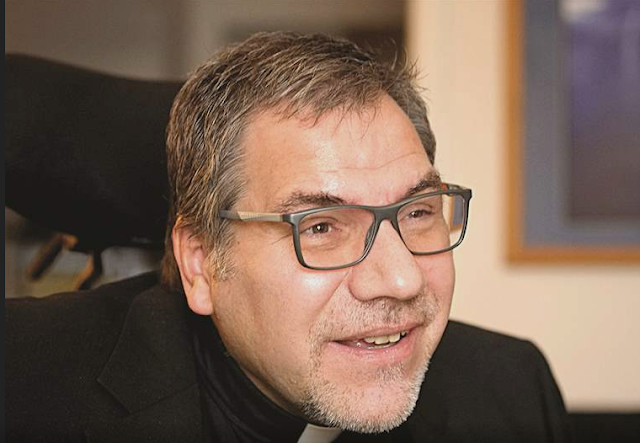 “It [became] so clear that the Diocese of Toledo was committed to me and said, yes, we want you — you’re ours,” he said. He was transferred to St. Thomas More Parish in Bowling Green, and then from 1998 to 2004 he was back at St. Meinrad because “they asked me to come back and do spiritual direction to the seminarians,” he said. Father Joe said that “after a year and some months of recuperation and therapy, officially I was retired” because of disability. Now he is at Sacred Heart Home in Oregon, operated by the Little Sisters of the Poor, as a resident receiving nursing care. With that arrangement, he has the opportunity to continue his ministerial service, health permitting. He is the chaplain there, and Sacred Heart has become even more of a home after his father moved into an independent living apartment and his mother became a nursing-care resident. His office is across the hall from his room, and he leads Mass at the chapel six days a week. For the last year, in part just to have time away from Sacred Heart, for two days a week he goes to St. Charles Hospital for “a very part-time chaplaincy” there. Father Joe is now 55, and he said he sometimes thinks about his life progression and his calling. After college and two years as a market researcher, he entered seminary and, after three years of classes, had “a pastor year in Sandusky. It was during that pastor year, working in a parish, that I realized I could not see myself doing anything else” than being a priest. At Sacred Heart Home, his flock is a little bit older, and wheelchairs are more common. “I’ve always been an optimist,” he said, “and I don’t see this as the dead end that some people, maybe some priests, would see it as. I really try, try, try, try to see it as an invitation and an opportunity I have that other people just don’t have. … What I’ve realized is that old people are people, and people have the same kinds of issues and sometimes maybe they focus more on the past than the future, but that’s because they have more past than the rest of us do. Father Joe said that his favorite scripture passage is from the Book of Matthew, Chapter 14, when the disciple Peter asks Jesus to bid him to walk on the water like Jesus was doing in the story. “Wouldn't you know,” Father Joe said, “Peter gets out of the boat where all the other disciples are, and he's doing it. He's walking on the water. “My own take on that is Peter gets sort of arrogant, kind of filled with himself, and probably looking back at the other guys, [says], ‘Hey, look at me! Look what I’m doing!' And as soon as he starts trusting more in himself than he does in Jesus is when he begins to sink. I think it’s really significant that we hear in scripture that immediately Jesus’ hand was there to save him, immediately, and as I’ve talked about it some over the years, I’ve said, ‘You know, it’s a good thing I’m not Jesus’ — for lots of reasons — but one of them is I would have let Peter sink for a little while, teach him a lesson.